St. Andrä is a village in the Lungau area of Salzburg, in the south-eastern border of the province. St. Andrä has a total population of approximately 700 people and is known for nice hiking opportunities in its surroundings. 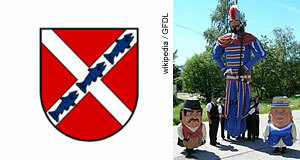 St. Andrä is one of the Lungau communities where Samson parades are still done, traditional processions of unclear origin. At Samson parades, local youngsters from the village carry around a statue of a giant in the uniform and armour of a Roman soldier, surrounded by male and female dwarfs. St. Andrä is not an overly touristy area, but hiking, mountainbiking and nearby (but not local) skiing might justify a visit for those who are looking for an off-the-beaten-track Lungau experience. Some water sports can be done in rivers of the area. St. Andrä was first mentioned in a written document dating back to 1266, then called "Abtsdorf" (Abbot's Village). This name refered to the monastery of Ossiach in Carinthia, to which the village belonged. The name "St. Andrä" referred only to the church; in the 19th century, this name was sort of expanded and officially used for the municipality. The main sightseeing attraction of St. Andrä (apart from the previously mentioned Samson parades) is the Taurachbahn, a narrow gauge railway that was once part of the Murtalbahn line. It was built in 1894 and a great leap forward for the little village. Today, the railway is operated only during the summer months; it links St. Andrä with Mauterndorf.